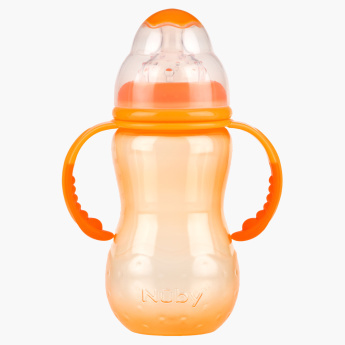 Nuby Feeding Bottle with Handle - 360 ml | Orange | Bpa free. Get this wide neck feeding bottle for your little one which comes with a handle. This can be changed from feeding bottle to a drinking cup with the help of a removable handle. This wide neck bottle helps your little one for easy latch on. Feature 1 : Bpa free. Feature 3 : Wide neck bottle helps your little one for easy latch on. Feature 2 : Transition from feeding bottle to drinking cup with removable handle.